Just in front of the Palazzo del Bo, seat of the ancient university, stands the celebre Caffe Pedrocchi, from the name of the first owner Antonio Pedrocchi. 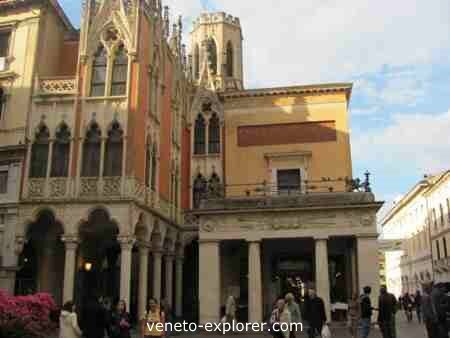 It is the most famous cafes of Veneto. In fact even Stendhal described it as the best club of Italy. Built in 1826, the Caffe Pedrocchi was later enlarged with a lateral neo-Gothic building. Since its opening it was divided into two sections. The first one, called il Caffé, was open 24 hours a day and for this reason it was known as the caffé senza porte, or cafe without doors. 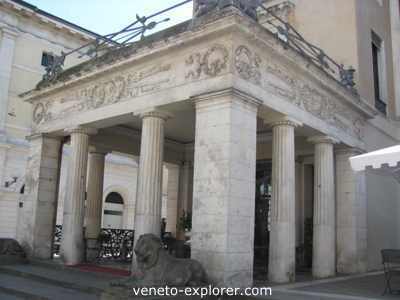 The second part, named Ridotto, was used for parties, balls, politic and business meetings. You can enjoy a coffee or an aperitif outdoor, watching people walking in the most lively part of the historic Padua. Or take a seat inside and dip into the unique ambience of the different rooms furnished in exotic styles: pompeiian, egyptian, medieval, renaissance, baroque, moorish. From the historic point of view the Caffe Pedrocchi is relevant for being the meeting point of the revolutionaries in the 1848 rebel movements againts Austrians: a bullet stuck in one of the walls is still visible. Nowadays the cafe still hosts conventions, exhibits and concerts. 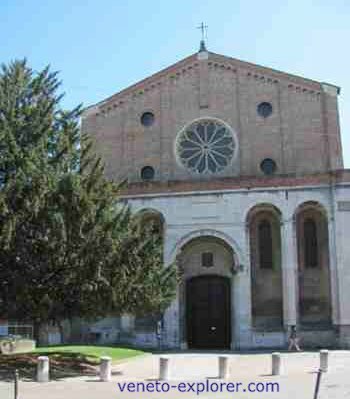 Continue on along Corso Garibaldi and you’ll get to the Chiesa dei Santi Filippo e Giacomo also known as Eremitani Church. It was built in 1276, then completed in 1306 with a keel-shaped wooden vault and the loggia made of stone in its facade. In its interior it was decorated by the best artists of the 14th and 15th centuries, but unfortunately the bombings of March 1944 destroyed almost all of the church and its frescoes. Just a few of them – painted by the great Andrea Mantegna -can be admired nowadays in the Cappella Ovetari inside the church. To the left of the Eremitani Church there is the Museo Civico, once seat of the Eremitani Convent. It is divided into the archaeological section, displaying stones and grave goods (interesting the tomb with studded vases dating back to the 8th century before Christ. There is a Roman section as well, with a collection of statues and mosaics. The museum hosts also the Pinacoteca Civica, with paintings of some of the most important painters of the Italian Middle Ages and Renaissance, such as Giotto, Guariento, Jacopo Bellini, Giovanni Bellini, Giorgione, Tiziano, Tintoretto, Veronese, Tiepolo and others. Noteworthy also the exhibit of jewels and contemporary artworks. Just a few steps away from the Eremitani Church there’s the entrance to the Giardini dell’Arena, a park encircled by walls and hosting some ancient Roman remains, and most importantly the Scrovegni Chapel, also known as Arena Chapel, likely the most important of the Padua attractions, known for hosting inside a very fine frescoes cycle depicting themes like Salvation and Last Judgments. It is a work of art of the medieval painting, universally considered a jem of the Middle Ages art. You’ll appreciate it even if you are not a Medieval painting enthusiast, such is its beauty. 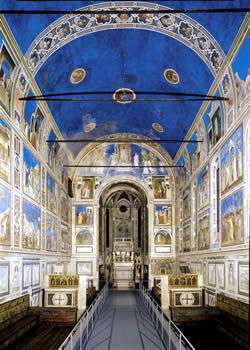 The author was the Florentiner artist Giotto, who in 1303 was commissioned by the wealthy Padua banker Enrico Scrovegni to decorate the vault of his private chapel. In the turquoise starry sky in the vault Giotto painted the protagonists of the Sacred History, such as the Virgin Mary, the prophets and Christ. The lateral walls are divided into 38 panels, depicting the story of Mary and Christ, the final judgement and the allegorical figures of the 7 virtues and 7 sins. Behind the altar stands the stone sepulcher of Enrico Scrovegni. Visits to the Scrovegni Chapel are strictly regulated, and only 25 people at a time are allowed to enter, after having stationed in a clearing chamber for 15 minutes, to not damage the microclimate of the chapel. See more information about reservation and visiting time on the Scrovegni Chapel official website.